Today, the Reserve Bank released the results of the 84th round of the Industrial Outlook Survey (IOS) conducted in October-December 2018. The Survey captures qualitative assessments of the business environment by companies in India’s manufacturing sector for Q3:2018-19 and their expectations for Q4:2018-191. Responses were received from 1,267 companies in this round of the survey. • Demand conditions in Q3:2018-19 presented a mixed picture - the assessment of production and order books showed signs of moderations relative to Q2:2018-19; responses in respect of capacity utilisation remained at the same level as in the previous quarter; in respect of exports, respondents expressed rising optimism. • Sentiments regarding the overall financial situation ebbed slightly, reflecting concerns on the availability of finance from both internal accruals and external sources. • While input cost pressures (on raw materials and salary expenses) eased, lack of pricing power shrank the profit margin relative to the previous round of the survey. 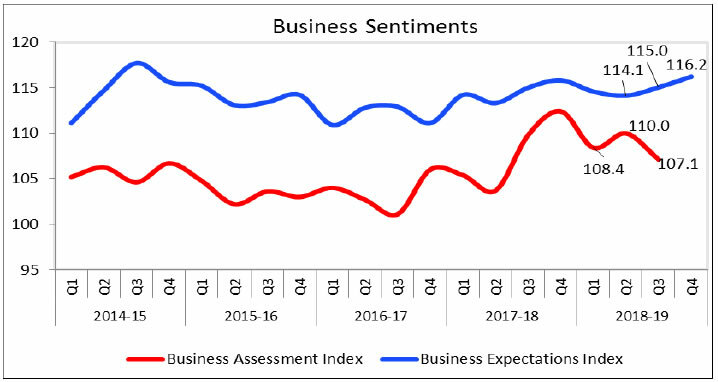 • Overall business sentiment in the Indian manufacturing sector moderated, as reflected in the Business Assessment Index (BAI)2 which moved from 110.0 in Q2:2018-19 to 107.1 in Q3:2018-19. • As regards expectations for Q4: 2018-19, respondents were optimistic on the outlook about demand conditions. • Sentiment on the overall financial situation also improved on expectations of easier availability of finance. • While optimism on the outlook for selling prices moderated, profit margins are expected to improve with reduced input costs (finance, raw materials and salary outgo). • The Business Expectations Index (BEI) improved from 115.0 in Q3:2018-19 to 116.2 in Q4:2018-19. @:Due to rounding off percentage may not add up to 100. ‘Increase’ in order books is optimistic. Footnote ‘@’ given in Table 1 is applicable here. Pending orders ‘Below Normal’ is optimistic. Footnote ‘@’ given in Table 1 is applicable here. ‘Increase’ in capacity utilisation is optimistic. Footnote ‘@’ given in Table 1 is applicable here. ‘Above Normal’ in Level of capacity utilisation is optimistic. Footnote ‘@’ given in Table 1 is applicable here. ‘More than adequate’ in Assessment of Production Capacity is optimistic. Footnote ‘@’ given in Table 1 is applicable here. ‘Increase’ in exports is optimistic. Footnote ‘@’ given in Table 1 is applicable here. ‘Increase’ in imports is optimistic. Footnote ‘@’ given in Table 1 is applicable here. ‘Below average’ Inventory of raw materials is optimistic. Footnote ‘@’ given in Table 1 is applicable here. ‘Below average’ Inventory of finished goods is optimistic. Footnote ‘@’ given in Table 1 is applicable here. ‘Increase’ in employment is optimistic. Footnote ‘@’ given in Table 1 is applicable here. ‘Better’ overall financial situation is optimistic. Footnote ‘@’ given in Table 1 is applicable here. ‘Increase’ in working capital finance is optimistic. Footnote ‘@’ given in Table 1 is applicable here. ‘Improvement’ in availability of finance is optimistic. Footnote ‘@’ given in Table 1 is applicable here. ‘Decrease’ in cost of finance is optimistic. Footnote ‘@’ given in Table 1 is applicable here. ‘Decrease’ in cost of raw materials is optimistic. Footnote ‘@’ given in Table 1 is applicable here. ‘Decrease’ in Salary / other remuneration is optimistic. Footnote ‘@’ given in Table 1 is applicable here. ‘Increase’ in selling price is optimistic. Footnote ‘@’ given in Table 1 is applicable here. ‘Increase’ in profit margin is optimistic. Footnote ‘@’ given in Table 1 is applicable here. ‘Better’ Overall Business Situation is optimistic. Footnote ‘@’ given in Table 1 is applicable here. 1 The survey responses are those of the respondents and are not necessarily shared by the Reserve Bank of India. The 83rd round (Q2:2018-19) survey results were released on October 5, 2018 on the RBI website. 2 For each of the survey round, two indices are computed - one based on assessment namely Business Assessment Index (BAI) and another based on expectations, namely Business Expectations Index (BEI). Each indicator for the respective period is calculated as a weighted (share of GVA of different industry group) net response of nine business indicators. The nine indicators considered are: (1) overall business situation; (2) production; (3) order books; (4) inventory of raw material; (5) inventory of finished goods; (6) profit margins; (7) employment; (8) exports; and (9) capacity utilisation. BAI/BEI gives a snapshot of the business outlook in every quarter and takes values between 0 and 200, with 100 being the threshold separating expansion from contraction. 3 Net Response (NR) is the difference in percentage of the respondents reporting optimism and that reporting pessimism. The range is -100 to 100. Any value greater than zero indicates expansion/optimism and any value less than zero indicates contraction/pessimism. NR = (I – D), where, I is the percentage response of ‘Increase/optimism’, and D is the percentage response of ‘Decrease/pessimism’ and E is the percentage response as ‘no change/Equal’; I+D+E=100. For example, increase in production is optimism whereas decrease in cost of raw material is optimism.